Wedding ceremony planning far in advance, and one of the main points is the budget of the entire event. Designing the event requires a significant investment. 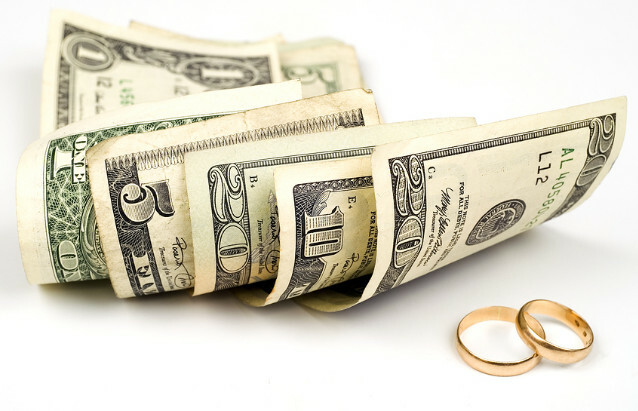 The question arises – how much money will you need to get married? In order that the wedding was organized correctly, with all the details you need to plan in advance wedding calculator. It will be a special list that records everything, even the smallest expenses. The wedding calculator is sure to tick all articles for upcoming expenses (wedding dress and groom's suit, wedding rings, accessories and bouquet for the bride). Of course, most convenient way to make a list in a tabular format and next to each item to indicate the approximate cost of services. So, where do you start writing a wedding calculator? Choosing a wedding dress, the bride can take advantage of several options. The first is to buy a wedding dress in the shop. The cost of the dress will vary (depending on cost of material and features cut). The second option is the individual tailoring of the dresses in the Atelier. Cost of wedding gowns starts from 4000 rubles, and the calculation takes the material price and cost of accessories. In this expenditure are included veils, lingerie, Bridal gloves, tiaras, hair clips and other decorations and details of wedding image. Wedding groom suit and the accessories (tie, bow tie or shirt) will cost differently, depending on fabric and design. Buying shoes for wedding, you need to consider that it will have to spend the whole day. Therefore, wedding shoes must be comfortable, convenient and high-quality. Therefore, it is not the cheapest item costs. Engagement ring – an essential attribute of the wedding ceremony. Often rings have to be ordered individually, we can provide additional engraving on them with declarations of love. When you create a unique wedding image the bride visits beauty salons to choose good master. Before the wedding, the bride can visit several tanning sessions, to her skin on the wedding contrasted favorably with the white dress. In the design of wedding Banquet hall you need to consider the cost of floral arrangements, balloons and additional decorations. The cost of the bouquet depends on the complexity of the floral arrangement, and can vary from 1500 to 5000 rubles. This list is included and a boutonniere in the buttonhole of the groom, the cost of which starts from 300 rubles and above. Counting the cost of the Banquet, you must consider the number of invited guests. The cost of the Banquet is included in the rent for the use of the hall, as well as services. The closer to the city centre is a cafe (restaurant) selected for a wedding celebration, the more costly his services. Another item of expenditure is the price of alcohol and wedding cake. A separate article wedding expenses is the services of musicians, toastmaster or DJ. This item includes the cost of the additional entertainment – fireworks, fire show, bartenders show, etc. The cost of one hour work of the videographer and the wedding photographer starts with 1000. In the list of additional wedding spending are the accessories of the wedding procession, rental of pigeons, a hotel room for the wedding night, etc. If you pre-compile a list of all proposed expenditure and estimated cost, it will be possible to calculate with a small margin of error, how much money will I need for the wedding.